Who said catering had to be boring? At Cliff's we say, Nuts to that! Call us and we'll bring a warm-hearted friendly smile and a rich and creamy scoop of blissful sunshine to you and yours. An instant memorable "Create your own Sundae Party!" Our custom-built, self-contained pushcarts are designed to fit in even the smallest spaces and have everything you'll need to Sprinkle a little Sundae on to any ordinary workday. Not only will we set up, but we'll clean it up too. You pick the four flavors and nine different toppings, and we'll come a-runnin' and a-scoopin'. We've been catering to businesses since the 80s, with events from fifty people into the thousands. So whether it's for a Summer Picnic, Employee or Tenant Appreciation, Holiday Party, Goal Achievement, or just for fun – think outside the cubicle. 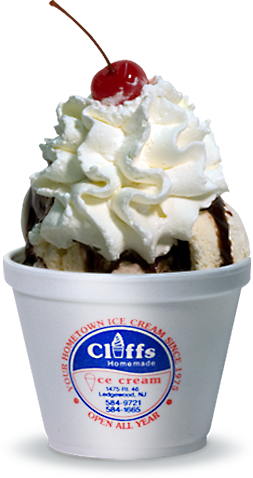 Make everyone smile with a tasty, homemade, creamy Sundae from Cliff's.